Are you bored with your old kitchen cabinets and would want to install a new cabinet? Your home’s kitchen is its nerve center, and a state-of-the-art kitchen would mean a palace-like home. But no ultra-modern kitchen is ever complete without having several matching cabinets. 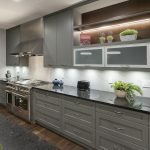 The market has lots of diverse kitchen cabinets and you should be able to explore them before settling for any one type. Along with that, whether you are looking for budget cabinet or high-end piece, I bet you’ll need to buy something that’s beautiful, cool and can last longer. With that said, let’s have a look at these kitchen cabinet materials and also their prices hoping it will give you a hint of the cabinet material you need. This cabinet is made from renewable, reclaimed or recycled materials. You can get this cabinet going for above $250 for an 18-inch-wide semi-custom cabinet and $1000 for a custom made of leather. It is made of heated vinyl and molded it over medium fiberboard .you can get this cabinets in different designs, shapes and patterns. For 18 inch wide cabinet you will get from $80 and about $345 for semi-custom which includes pretty colors and smooth texture. Thermofoil cabinets can be inexpensive and are available in all designs. Wood is the most popular material used to construct a kitchen cabinet. You can build the drawers with veneers or solid wood. Wood can adapt to any designs and scratches are easily repaired but changes in humidity which can damage the core and surface of the wood. You can pay well over $800 for custom cabinets. Laminate cabinets is Composed of layers of paper with a printed paper that looks like a wood, plastic resin and tough plastic film. High pressure laminate are more durable and resist stains while the other hand it is not impenetrable hence cracks are hard to repair. Custom laminate cabinet usually goes for $680 and $200 for semi-custom one. This is the most expensive and less common material for cabinet so far. Metal is made of aluminum or stainless steel which is strong and durable. Metals doors are unaffected by heat if the metal is treated. Metal cabinets can scratch and dent and more also surfaces show oil smudges. This metals cost from $150 for a stock model to about $1500 if you need a costumed one. 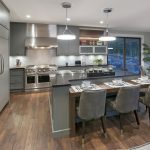 For more ideas, please stop by one of our showrooms in Calgary and Canmore today and speak with one of our kitchen cabinet design experts at BVK today.